Within the SmartSea project, the economic, social and environmental impacts of the growth of blue economies are analysed. Both statistical databases of the current and past activities, and the current economic state and potential (i.e. turnover and employment) of different blue business sectors in the Gulf of Bothnia have been assessed. Furthermore, the legislation and strategies, which are guiding Blue Growth, but also might act as a hindrance to its growth in the region have been considered. The study is not finished yet. However in the following initial approaches and aspects are outlined. One definition for Blue growth is "the long-term strategy to support sustainable growth in the marine and maritime sectors as a whole", but how to determine what is good and sustainable both for the whole, and to the parts that form it? 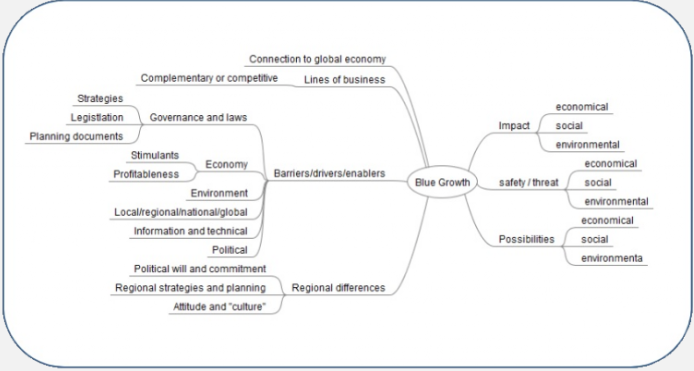 How to analyse economic, social and environmental impacts of the growth of blue economies? How to better understand interactions between factors affecting the blue growth economies? The study is not finished yet. However, in the following the approach and method is outlined to show the context of ongoing work within the project SmartSea. All upcoming results will be added as soon as they are available. A common understanding of the definition of Blue Growth is still missing. The Commission defines it as: "Blue Growth is the long-term strategy to support sustainable growth in the marine and maritime sectors as a whole". Since the Blue Growth Strategy is not a legislative instrument but an outline of principles and guidelines, it is crucial to integrate them into relevant (EU/national/local) policies and legislation. Also, these principles and guidelines should be made easier to reach and understand for different actors, not to forget entrepreneurs and companies that might have potential in the sector. Furthermore, the region of the Gulf of Bothnia differs from other EU sea regions in various ways, but also differences within the region are notable. Therefore, more collaboration between different actors to support planning in the coastal areas to exploit potential of Blue Growth and maritime spatial planning (MSP) is a suitable approach for this task. In order to understand these interactions, it is needed to analyse both, statistical databases of the current and past activities and the current economic state and potential (i.e. turnover and employment) of different blue business sectors in the Gulf of Bothnia. On the other hand the analyses has to consider the legislation and strategies, which are guiding Blue Growth but might act as a hindrance to its growth in the region as well. Water transport is in terms of jobs and income the main sector of the current blue economy in the Gulf of Bothnia region. For regional strategies economic indicators are usually valuable. Therefore the economic value of the blue economy of the Gulf of Bothnia region needs to be quantified more comprehensively. Strategies guiding blue economy are numerous and fill the requested need, however Blue Growth is not (at least yet) integrated and thus adds one more ”wish” layer. Strategies seem to emphasise a more sustainable view in the future and are more based on expectations, politics, not so much on economy. According to strategies, coastal tourism is seen as the most important potential; biomass and energy is also mentioned. The strategies recognize geographical challenges and current status, noting sustainability aspects. However, concrete tools and activities are still weak and those aspects are something that SmartSea could contribute. As a result of this study it is expected to find answers to some of these aspects. The region of the Gulf of Bothnia differs from other EU sea regions in various ways, but also differences within the region exist. One main approach to minimize these barriers is to foster collaboration between different actors for support of planning in the coastal areas and for assessment of potentials of Blue Growth. Maritime spatial planning (MSP) can facilitate this task. In this respect, similar situations may exist in other sea regions and results may be transferable to a certain extent.